Click here to view the live broadcast. 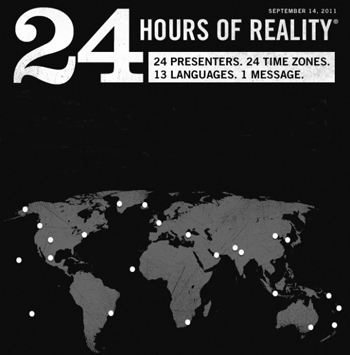 On Wednesday, September 14, and Thursday, September 15, Joel Towers, the executive dean of Parsons The New School for Design, will participate in the first “24 Hours of Reality,” an event of the Climate Reality Project, founded and chaired by former Vice President Al Gore. With 24 presenters in 24 time zones around the world, the event will offer a round-the-clock, global snapshot of the climate crisis in real time. Towers will participate in panels taking place on September 14 at 8:00 p.m. EST, and September 15 at 12:00 p.m. and 1:00 p.m. EST, which will be broadcasted live on the Climate Reality Project website. Among the other expected participants, who will engage in panel discussions with Executive Dean Towers in addition to Al Gore, are global climate scientists Robert Correll, Michael Oppenheimer, Stephen Pekar, and Henry Pollock. Renee Zellweger is scheduled to host the September 15 panel at 12:00 p.m. EST. Representing the discourse that takes place across campus, Towers will address issues such as the role of design in confronting complex challenges such as climate change, the part that cities can play in improving our environment, and the “design flaws” that have led to climate change. To learn how you can participate in 24 Hours of Reality, visit the Climate Reality Project website.